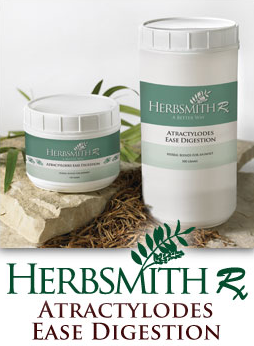 Herbsmith Atractylodes Ease Digestion improves digestion, prevents spasmodic gas colic and low-grade diarrhea and helps the mature horse thrive. This blend harmonizes the digestive function from the stomach to the colon. By maximizing digestion the utilization of feeds will be greatest and therefore can be used to optimize health in the older horse. Improved digestion will decrease the production of gases, which can cause gas colic and utilize feed maximally to prevent diarrhea. Clinically this blend is used to prevent chronic spasmodic colic, low-grade diarrhea, and to maximally utilize feed in the older horse. Spleen and stomach function receives and transforms the eaten food into Qi or the vital energy of the body. Distribution of this process can lead to any number of gastrointestinal dysfunctions. The herbs in this blend improve the spleen’s transporting functions, promote normal movement of Qi and harmonize the actions of the stomach. The spleen works optimally at transforming and transporting when dry so there are herbs added to dry dampness. Also herbs have been added to resolve food stagnation. Traditional Formulas: Administer two (2) tablespoons twice daily for the initial twenty dayst, then two (2) tablespoons daily thereafter. Note: In the event the horse refuses to eat herbs, start with small amounts in the grain until the horse is acquainted with the taste or try the Flax Plus version of this formula. Almost all horses will eat the herbs in their grain.